The cold wind was unexpected. After all, it was the middle of July, and this was the Caribbean. 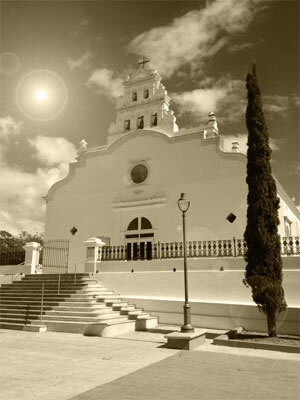 The church of Los Corales was cemented into the side of a mango-covered mountain just west of Santiago. It was not nestled like most mountainside churches; rather, it was cemented. A new building for an old generation. White painted cement, a slate porch, and frosted white doors. Around the church, there were a few strikingly new houses owned by returning Americans, and a bodega that filled at eleven in the morning and was empty again soon after. On that day it was raining. A heavy downpour that tinged on the new tin roof like angles playing marbles. The rain had brought the cold wind, and it swirled through the packed church through every open window. But no one seemed the notice. The abuelas continued to fan themselves. The teenage girls adjusted their white H&amp;M dresses bought by their American cousins, and their American cousins were counting the days before they could go home and only go to church on Christmas. But abuela was watching now. The cousins exchanged glances and continued reciting prayers they only half-remembered. The real action was not in the church, but on the porch. A group of primos were gathered, snapchatting and teasing each other. It was too crowded inside, they reasoned, so they might as well stay outside. An old uncle stood by the door and every once and awhile would send them a disapproving look, but it was only half-meant. The whole family had not come home for a long time. The rain picked up, but there was no attempt to close the windows. No move to close the door. The priest remained at the altar, praying, the abuelas continued fanning, the girls checked their makeup in the window reflection, and the boys were now discussing quadding on the porch. The wind whirled around Los Corales, a church cemented into the mountainside. Julia Torres is a New Jersey writer who works in academic publishing. She attended Saint Joseph’s University where she was very involved in Saint Joseph’s thriving writing community and where she was the co-editor in chief of the university’s literary magazine, The Crimson and Gray. When she is not busy writing and reading, she enjoys spending time on her family’s horse farm in central New Jersey.